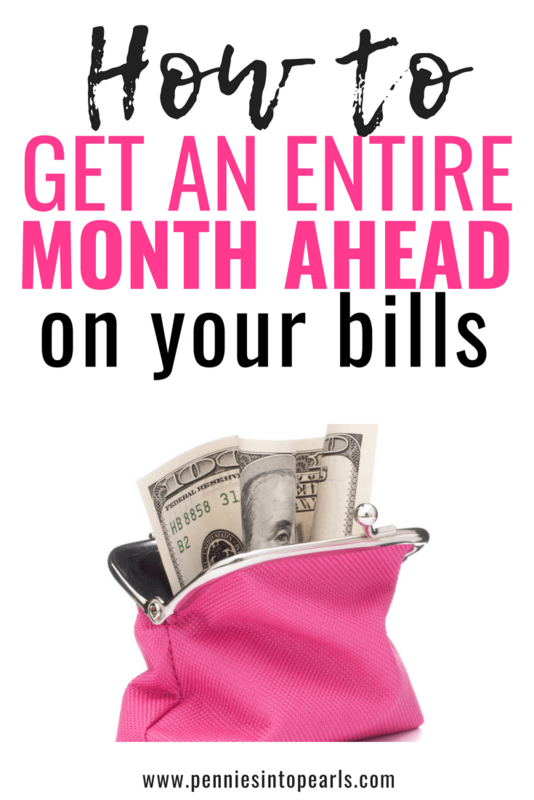 The solution our family has found most helpful is to get one month ahead of your bills. This process can be very simple and opens so many doors for living a financially free life! Since we accomplished this savings goal, our family is able to easily set up a cash envelope system and start doing monthly grocery shopping. These two habits have allowed us to set a budget that we can actually stick to every month. As a result, has helped us to pay off over $20,000 in debt and we are now in the process of getting ready to buy our first home. You can check out our monthly budget updates to see how all the numbers on how we manage our one income budget and make it work while living in one of the most expensive cities in the US. All of which would not have been possible if we didn’t get ahead of our bills. When is the Right Time to Get Ahead of Your Bills? I cautiously say that setting the goal to get one month ahead of your bills should take priority over paying off debt. The only reason I hesitate to mention this is that I don’t want you to lose focus. Get one month ahead of your bills and then immediately resume your debt free path! Whether it is debt, retirement, or house hunting, it doesn’t matter what your financial goal is, an unexpected expense can completely derail you and cause a much longer course to get back in line. But here is a giant BUT, I would still recommend building your $1,000 emergency fund before trying to get one month ahead. Before we go any further, you first need to make sure that you have a budget that actually works for your family. I know you have probably “tried” setting a budget before and for one reason or another, it doesn’t seem to stick. Hello overdraft fees! Coming from a lady who is all to familiar with overdraft fees, I know how frustrating that can be! Can I show you how to set a budget that actually works for your specific family? Just click this link to see how our family finally figured it out and how you can easily customize your own budget in just one night! 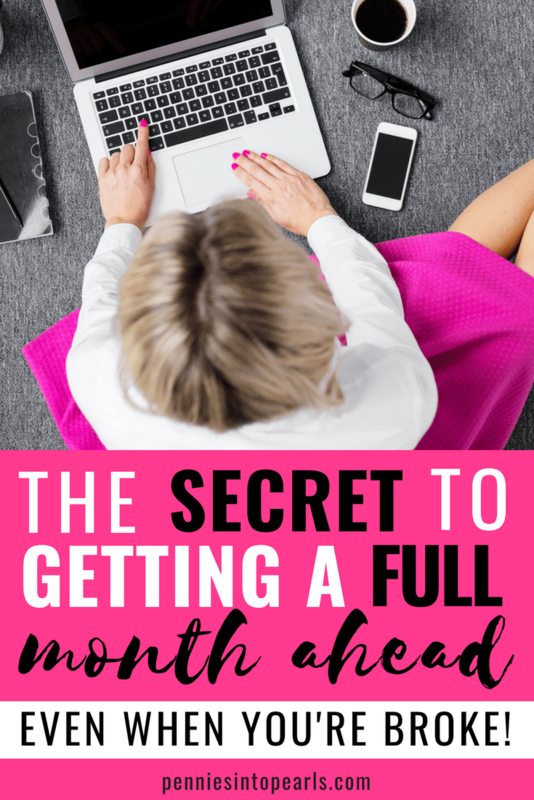 When it comes to getting one month ahead of your bills in relation to your budget, the focus needs to be minimizing your expenses and savings. This is going to free up your cash so you can put your savings temporarily towards your next months bills. The simple idea behind getting ahead of your bills is to have that entire month’s worth of expenses saved up now. You will now be living off of last month’s income, rather then living day-to-day. Now that you have your budget set in place and now know exactly how much cash you have to work with, set a temporary goal to put that money towards building a savings fund that covers an entire month’s worth of bills. Once you have this savings in place, then immediately resume your long-term savings goals or debt repayment plan. If after setting your budget you don’t have a bunch of cash floating around waiting for direction. Ha! how nice would that be? Here are some suggestions on how to get extra cash in the next 30 days. Get the family on board for a no spend month. De-clutter your home and sell any unneeded items. Once you start paying attention to these three categories and brainstorming ideas on how to make them work in your family, you will quickly start seeing opportunities to build your “month ahead savings”! Are you ready to get ahead of your bills? What questions do you have? Let me know down in the comments below and I can help you work through it!